As told on Arkansas’ White River. (This story originally ran in the Winter 2013/2014 issue of The Drake). TAKE A MINUTE to consider your fishing net. A stick, a hoop, some braided line or rubber bagging–tossed in the car, carried around as luggage, rarely admired or even thought about. A net is like flood insurance: You don’t need it, until you really, really need it. These are the kinds of random, slightly panicked thoughts that run through your mind–punctuated by a lot of self-directed abuse–when the net in question is laying three hundred yards upriver, leaned against your boat, while you are waist deep and losing ground to one of the biggest brown trout of your life. You tell yourself that you’re an idiot, a dumbass, for walking away without it, and you are correct. On Arkansas’ White River, your net is not optional equipment. Some excuses are in order. The first is that Atlanta, Georgia, is a ten-and-a-half hour drive from Cotter, Arkansas. When you make that drive after the five o’clock whistle blows, as I did, some forgetfulness the next morning is inevitable. Especially when your bed is a Honda CR-v. I make this annual pilgrimage to Arkansas specifically to fish the White River, because I want to keep a connection to my home state. Most years I come in the fall, when big browns do their business at night, then bail off the redds when the sun crosses the treeline. Unmolested, they would probably just stay put and screw all day. But when the first redneck leaves a prop-scar across that shoal at sunup, the biggest fish slide off. Don’t believe a boat guide who says the fish are unaffected by his arrival: He only sees the ones that are left. If you want to hook the big dogs, get up early and be the first one there. I generally kill my engine upriver and use a flats pole to quietly navigate downstream to the good stuff. Most mornings I can track the fish as they leave the redds, like turkey hunters marking the roost. On this occasion I had done exactly that; spotting the holding lie so I could slip below and get an angle for a cast. 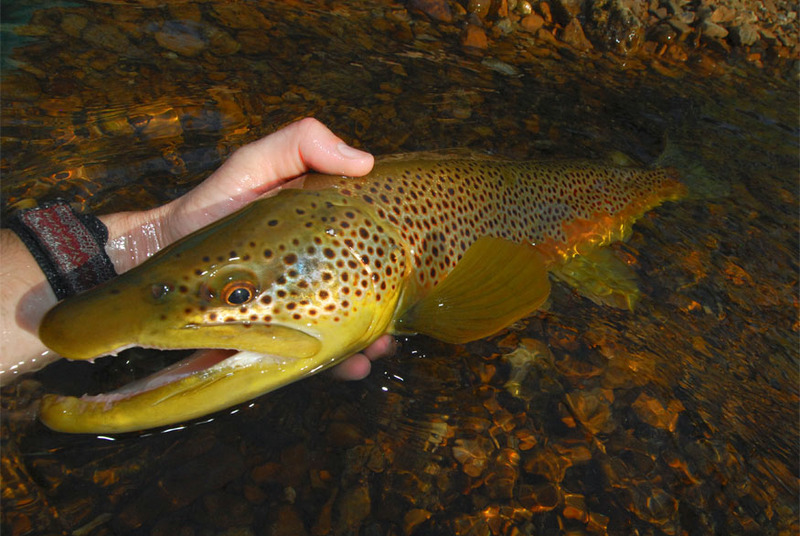 White River browns see huge amounts of angling pressure, mostly from local johnboats floating sideways. Consequently, the fish are wary, especially of larger hooks and flies. As an experiment on my 30th birthday, I caught exactly 30 fish. Then I quit fishing, sat on the bank and drank beer with my friends. That day I fished a single two-fly rig: A heavy silicone egg to drag my flies down, with a size 18 scud dropper. I caught 15 newly stocked rainbows on the egg, stupid as teenagers, and fifteen mostly river-born browns on the tiny scud. This is the part of the fishing story where the author usually bullshits you about his epic fight with the beast, culminating in triumph. We all know it’s a lie; either the fish got away or the fight was unremarkable. But that’s why fishermen can sympathize with the little boy who cried wolf. Because occasionally, the story is true. The big fish are pod-masters. If they take up a position, every other fish fans out behind, like a punt-return wedge formation. That means you get one shot–your fly must get down to the fish’s level and find the exact seam the biggest fish is sitting on. Otherwise, it will drag through his sonar-net of buddies, and the whole pod will spook. You can be the greatest fisherman in the world and this scenario is still mostly luck. You can’t see the fish, you can’t read the micro-seams of current, and you don’t really know the depth, because getting close enough to know means you’ll spook the fish. It’s sort of like the Heisenberg Uncertainty Principle: Knowing the target’s location ensures that it will be somewhere else. And so you take you shot into the dark water. You’d cross your fingers but you can’t, because they need to be ready to set the hook. And then the bobber drops, and you set the hook, and you’re still unsure, because there are plenty of stupid rainbows in this river. It’s not until you feel the pulse–that head-shake like only a big fish can produce–that you know you’ve hooked the real target. And that’s when the panic sets in, because this is why you drove tend and a half hours and this is what your buddies are going to ask about. Then you see your net leaning against the boat… way upriver. The fish’s run was so far upstream that I had hopes of reaching the net. But then he turned. By this point I was out of the water, trying to slide him into the bank using his own momentum. But he found a moss pile and I knew it wasn’t happening, so I jumped back in, steering him out onto clear gravel. Then he ran dead at me, like the shark at the end of Jaws. He was going to wrap me up and break himself off on the only obstruction available: my legs. You know how sometimes, at the end of a long season, a baseball team with a 50-and-110 record, like the miserable Houston Astros, will step up and knock off a playoff contender? For one game they hit their potential exactly because the pressure is off and everyone knows they’re going to lose anyway? At that moment, I was a Houston Astro–a crappy player, lucky to be in the Bigs, with a ground ball dribbling my way and one shot at glory. And so I squatted, and I caught that fish with my hands. I tossed him right onto the moss bed, and when he’d finished thrashing I carried him to my net. All twenty-three inches of him. In other words, truth is relative; what is true is what matters. A long driver and a fair-hooked fish that wasn’t scraped off a redd–that matters. It remains one of the best fish of my life; a strong connection to my home. I look at the photos from time to time when I’m in a fishing dry spell just to remind myself that it happened. Zach Matthews runs The Itinerant Angler website in between jobs as a writer and, allegedly, a trial attorney. He attended University of Tennessee law school (allegedly), but remains hopeful that U of Arkansas football will matter again. 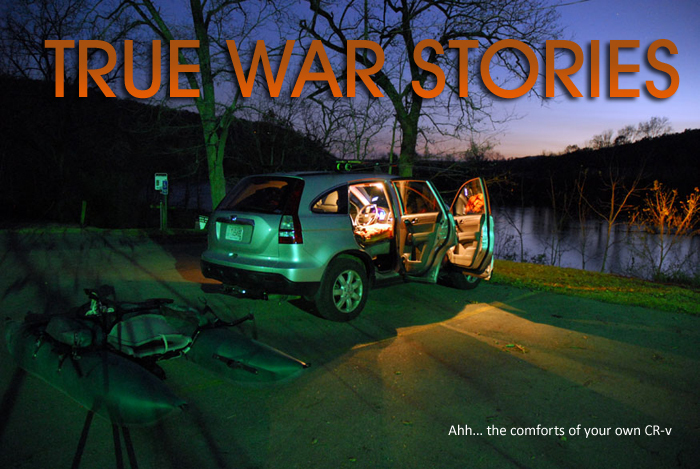 5 Responses to "True War Stories"
Parked at the same spot this morning before daylight. Just at daylight I was standing in the water getting ready to cast when I heard an eagle. Looking up I saw an eagle and an osprey fighting over a fish the osprey had caught. The eagle forced the osprey to drop his fish, then caught it before it hit the water. Great! Caught a lot of fish, too. Great write up. I’m headed to the Little Red in a few weeks, and hope for similar success. Excellent read, Zach. I like the reference to The Things They Carried. Incredible book. Hey Zach, you ever try swinging really big streamers over them at night on one of the two handed sticks?